In more ways than one, General "Black Jack" Pershing's expedition into Mexico of 1916 was a rehearsal for America's entry in World War I. The punitive expedition that was set up to capture Pancho Villa and take revenge on his attack on American soldiers in Columbus, New Mexico, not only tested the army's military capacity. For the first time in history the U.S. Army was also confronted with a new kind of reporter - the newsreel photographer. On March 16, 1916, Secretary of War Newton D. Baker - after consulting with the army - announced that six correspondents would be attached to Pershing's army. The only accredited photographer was William Fox who worked for Underwood & Underwood. His pictures would be syndicated to all American newspapers. Among the embedded journalists were no Hearst reporters and no cinematographers. Ignoring the newsreel companies did not prove to be a wise strategy. With the news of Villa's attack breaking in on all headlines, the Hearst organization sent one of their most enterprising newsreel cameramen to Mexico: Tracy B. Mathewson. Born in 1876 in Augusta, Georgia, Mathewson started working as a photographer for the local papers in Atlanta around 1905. One of these newspapers, the Atlanta Georgian, was controlled by the Hearst news organization. 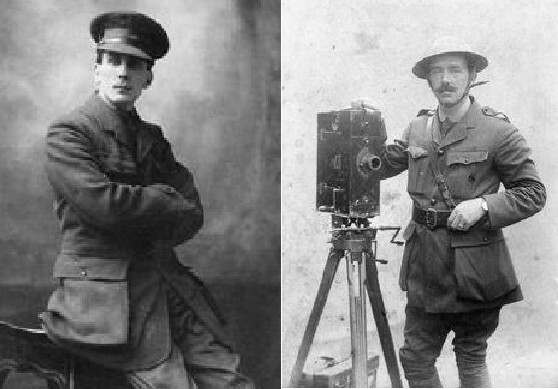 Combining still photography with the latest medium of motion pictures, Mathewson became a newsreel cameraman. The Library of Congress has a picture showing both Mathewson and William Fox in Mexico, dated January 29, 1914. The photograph was copyrighted by the Mutual Film Company and this suggests that Mathewson at the time may have been covering the Mexican War for Mutual when the film company struck a deal with Pancho Villa to produce exclusive battle pictures of his military campaigns. By 1916 Mathewson had earned himself a reputation as one of the most resourceful news photographers in the United States. According to Scott M. Cutlip in his book The Unseen Power on the history of public relations, when D.W. Griffith's Birth of A Nation was released in 1915, the public interest in the Klu Klux Klan had risen to a degree that Mathewson decided to become the first cameraman to capture the Klan. Accordingly, he dressed up a group of Afro-Americans as Klan members, just like he had seen in Griffith's movie, and produced some spectacular news pictures that were reproduced in renowned newspapers such as the New York Times. When Pancho Villa's border raid made national headlines Mathewson was working nearby for the Hearst-Vitagraph News Pictorial. 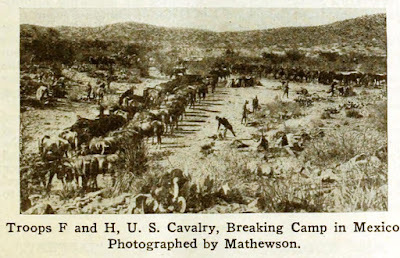 Mathewson said he got into Columbus, New Mexico, one day after Villa's attack and was allowed to follow General Pershing's forces until they reached Casas Grandes where Brigade Headquarters had been set up. Mathewson's pictures were by all accounts a major scoop. Moving Picture World in the issue of April 8, 1916, reported "stirring scenes" in the Hearst newsreels, showing General Slocum and his staff preparing to get Villa, while a guard of honor paces before his tent guarding the Americans who had been killed in the raid. More pictures by Mathewson, showing victims of the border raid, were to be released in Hearst-Vitagraph News no. 23, on March 20, 1916. Despite all military regulations Mathewson managed to get himself attached to Pershing's staff, together with other correspondents. Around April 1, 1916, at Brigade Headquarters in Casas Grandes his picture was taken. Mathewson, proudly holding his movie tripod, can be seen in the middle together with his fellow journalists. The picture clearly shows that the War Department's attempt to regulate any kind of photography during the expedition was a dismal failure. 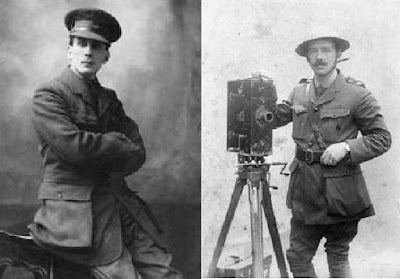 Apart from the "official photographer" from Underwood & Underwood not only Mathewson was covering the war but also his colleague Adrian Duff, news photographer for the American Press Association. The U.S. Army clearly was at a loss to control any kind of pictorial coverage of their invasion of Mexico. American reporters at Casas Grandes, April 1916. Mathewson is in the middle holding his movie tripod. To his right photographer Adrian Duff. The picture was probably taken by William Fox. Source: National Archives, Washington, D.C.
To make matters even worse, the Hearst organization promoted Mathewson in their own publicity. In a press statement released on March 27, 1916, it was announced that Mathewson - "designated as official photographer of the War Department" - had just returned to the United States together with his films that were sealed up "to be sponsored by the War Department" before exhibition. This attempt to cash in on the publicity value of Mathewson's war pictures created an avalanche of complaints by rival newsreel companies, notably the Selig-Tribune Weekly that was controlled by the Chicago Tribune. Editor Lucien Wheeler demanded that the War Department either confiscate Mathewson's films, because he had taken these without proper authority, or share prints of the negatives with other newsreel companies. On April 18, 1916, with Mathewson's films still in the custody of the War Department, all major newsreel companies combined forces and jointly requested the War Department to release his films for syndication. They desparately wanted Mathewson's pictures and were willing to work together if necessary. The documents at the National Archives on Mathewson's film work do not reveal how his motion pictures were used in the end. But the government records do show that the military ban on private film makers entering Mexico was totally ineffectual. The U.S. Army simply didn't have an appropriate administrative mechanism to control motion picture photography. 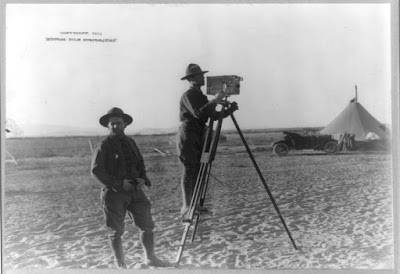 When America entered World War I in 1917, the frustrating experiences with Mathewson during the Punitive Expedition must have contributed to the decision to accredit no civilian photographer with the American army and make the U.S. Signal Corps solely responsible for any film coverage on the European battlegrounds. Mathewson's own story on his experiences in Mexico - no doubt embellished by a Hearst copywriter - can be read and downloaded here. Until his retirement Tracy Mathewson remained active as a professional photographer and newsreel cameraman, working for Fox, Pathé and as a freelancer. He was personal photographer to Edward VII, Prince of Wales, during his visit to Canada in 1919. In 1955 Mathewson received the Burt Williams Award for distinguished service in photography. Tracy Mathewson died in 1957 in Jasper, Georgia. To mark the centennial of World War I the Imperial War Museum has digitized its film collection - one of the oldest and largest in the world. 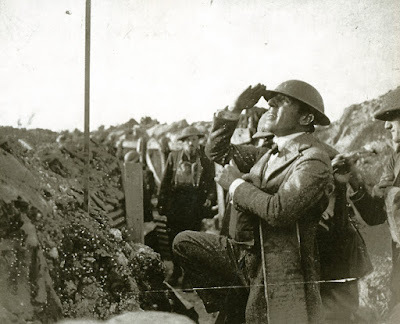 Over 200 hours of film, contributing to one quarter of total footage, can be seen on the European Film Gateway 1914, the webportal featuring the Great War on film. During our research on the American cinematographers of World War I we were fortunate enough to discover some interesting footage in the film collection of the Imperial War Museum, notably scenes from Albert K. Dawson's The Battle and Fall of Przemysl (1915). A highlight of this film collection in the Imperial War Museum is the original 1916 record of The Battle of the Somme, now granted UNESCO "Memory of the World" status. Shot by two official cinematographers, Geoffrey Malins and John B. McDowell, the film depicts the British Army in the preliminaries and early days of the Battle of the Somme. A huge success, the film was watched by 20 million British people in the first six weeks of exhibition and distributed in eighteen more countries. The film had a terrific impact on public opinion. This was in part due to its graphic depiction of trench warfare, including showing dead and wounded British and German soldiers, as well as the fact that it opened while the battle was still raging and casualties were being taken. Check out the video for more information on how this movie was made and the historical World War I film collection of the Imperial War Museum. After almost one hundred years, the making of D.W. Griffith's World War I drama Hearts of the World (1918) still is surrounded by mysteries. Griffith made two trips to the front while he was working on this new film, and contemporary publicity reported he and his party worked under extremely dangerous conditions. But as for authenticity most of his frontline scenes were staged in front of the camera in Britain and the United States. Real World War I footage in this film is extremely rare and came from Frank E. Kleinschmidt's film War on Three Fronts (1917) which was edited with much artistic license. 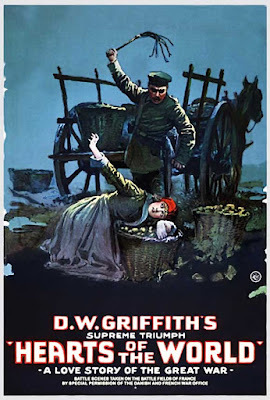 Commissioned by the British government, Griffith started production of this movie shortly after America had entered the First World War. Hearts of the World clearly was a propaganda undertaking, but it also has the 'Griffith touch' and is primarily a love story. Two American families share a house in a peaceful French town. The Boy (Robert Harron) of one family and the Girl (Lillian Gish) of the other have a romance. When war breaks out the Boy joins the army and the Girl puts her wedding dress in a box. Despite heroic resistance from the defenders of the town, they are overcome by the brutal onslaught of the enemy. The village is destroyed by heavy artillery and the Boy's father and the Girl's mother and grandfather are killed. Griffith’s Germans are of course depicted as brutes, as German villains usually were during the war. At one point in the film the Girl’s virginity is even threatened by Von Strohm, the main villain. The actual scene showing the cause for all this mass killing however came from a completely different source and movie: Frank E. Kleinschmidt's War on Three Fronts. In 1916, Kleinschmidt had returned to America with his film showing his experiences in wartime Europe on the eastern, the Italian and the Balkan fronts. Kleinschmidt showed his movie on the West Coast and in the Midwest before it was released by Selznick Pictures in April 1917. Among the footage found by the authors while researching our latest book American Cinematographers in the Great War is a scene showing an Austrian artillery crew firing the latest type of 15-centimeter gun. Filmed by Kleinschmidt with the assistance of the Austro-Hungarian military press office, this scene was taken around Tarnow in May 1915, during the attack of the Austro-German army on the eastern front. Kleinschmidt's film was later bought by Griffith and this key scene was edited into Hearts of the World, but now the Austrian gunners are introduced as savage German soldiers out to destroy the peaceful French village with everyone in it. Despite the way it was used, it is one of the few authentic World War I scenes in Griffith's classic film. A video showing both the original scene filmed by Kleinschmidt and the edit done three years later by Griffith has been uploaded on our YouTube channel.